This quote made famous by U.S. football coach Vince Lombardi explains why I usually hate competition. 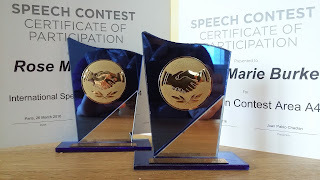 Yesterday, I lost a speech contest in Toastmaster's International Speech Contest, specifically the Area A4 contest. Why do I feel so happy about it? When I joined Toastmaster's three years ago, it was to learn public speaking. But I wondered what the contests were all about. I thought it was CRAZY that the club used so many of its resources on competitions. There are two contest seasons a year, starting in October and then again in March. Three things changed my mind: 1. The contestants seemed to be having such a good time! 2. Contestants, whether they won or lost, talked about how much they learned. 3. Many more men compete than women, partly explaining why the top champs are usually men—that got my dander up. I vowed to start competing. This was my third contest, and I finally won at first level, the club contest. Then began the hard work of revising and rehearsing it for the area contest, where competition is severe—we have some world-class talent. International and evaluation. My first trophies! Certificates of participation in the A4 area contest. That was icing on the cake. Because I already felt like a winner. I learned a lot about myself: that I can memorize a 7-minute speech, speak comfortably in front of a crowd, and make them laugh! Women tend to avoid competition and instead seek cooperative endeavors. I believe that because we tend not to compete, we lose out in so many ways—that go a long way to explain the gender gap. But when competition and collaboration exist together, as it usually does at Toastmasters, it's a win-win situation. So what do we have to lose by friendly competition? From what I've learned, nothing at all. Unless we fear becoming better, and tapping the power within ourselves and others. What to follow this blog? Send me a request at rose.burke89 "at" yahoo.fr. Or follow me on Google+ by clicking on the Follow button near my portrait.